St. Pat's announced on Wednesday morning that the club is planning the development of a new stadium in Inchicore. 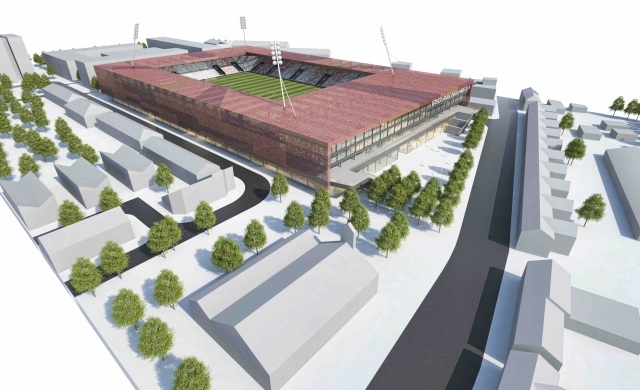 With a working title of 'The Richmond Arena', the new ground has a planned capacity of 12,000. The development at St. Michael's Estate will also include the construction of new houses and an Inchicore Town Centre with state-of-the art retail, leisure and community facilities on top of which would sit the club’s new stadium. Once planning permission is granted, it is estimated construction would be completed within two years. In the coming months Dublin City Council is set to decide on the future of St Michael’s Estate. The City Development Plan envisages the development of a high-quality, vibrant, mixed-use urban quarter which will help to regenerate Inchicore. The plan which is being led by Garrett Kelleher of St Patrick’s Athletic can accommodate whatever housing density and mix is required by Dublin City Council while also providing the area with major retailers and leisure facilities, in addition to civic and community facilities. The type of facilities to be provided will be agreed with the City Council but could include a library, indoor sports hall, civic theatre etc. The innovative feature of the development is the inclusion of a UEFA Category 3 stadium, with 12,000 covered seats and all modern facilities, at first floor level. A first floor level stadium is a new model for Ireland but is tried and tested in Europe within the urban environment. The stadium has been designed by a leading European architect, David Mizrahi of HRS International who has been responsible for many fine stadia in Europe. He was also the lead architect with Santiago Calatrava on the Samuel Beckett and James Joyce bridges in Dublin. The stadium development will be financially independent and will not be reliant on receiving any Government grants. The stadium will be independently managed and will serve as a venue for not only St Patrick’s Athletic FC home fixtures but many other uses which will be an asset to Inchicore and indeed to Dublin as a whole. The stadium has a working title of the Richmond Arena, recognising its proximity to the historic Richmond Barracks and its location just across the road from the club’s current home, Richmond Park. The completion of the development, which will be project managed by FESP International Ltd, will take approximately two years from when planning permission is granted. St. Pat's President Tom O'Mahony believes the development will be a "game-changer" for both the area and the club. "It would give our supporters an ultra-modern stadium which would also be suitable for a wide range of community events," said O'Mahony. "It would transform Inchicore and would realise the City Council’s vision of a vibrant, high-quality urban quarter. Below is an image of what it is envisioned the new stadium will look like.